1. Membership: As a member of the International Authority for Professional Coaching & Mentoring you will receive our newsletter In Touch, our prestigious magazine Invenio, and regular invitations to attend a wide range of industry related and business development webinars. This level of members typically suits HR. practitioners, managers, consultants and trainers who have a general interest in the benefits of utilising coaching and mentoring. 2. 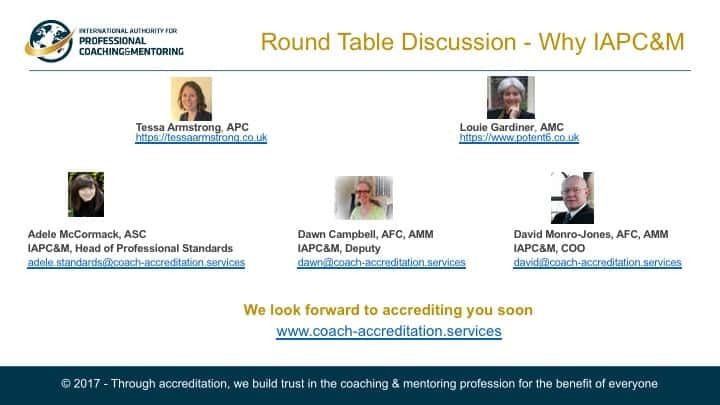 Accredited Member: We are passionate about protecting everyone from non-accredited practitioners and training providers, so we only promote the highest possible standards of accredited coaches, mentors and coach/mentor training providers. be granted your logo and digital certificate. be offered discounted by our strategic partners such as supervision. If you are an individual coach or mentor, then click here to find out more about professional accreditation. If you have any questions, please contact us. We don’t have an email culture, we prefer to talk with you about your requirements, so when we’ve received your enquiry, we’ll respond with an invite to meet you over a tea, coffee, or smoothie via Skype, Zoom, phone, or even face-to-face as necessary to deal with your query if that suits you too.